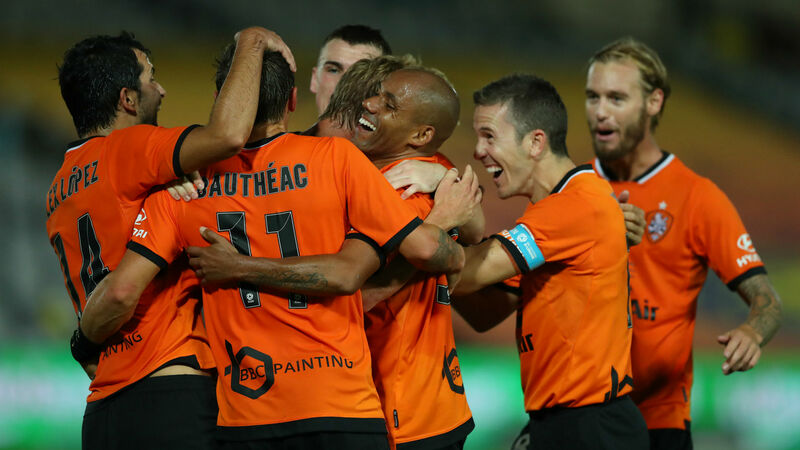 Brisbane Roar won 5-3 at Central Coast Mariners as the A-League's bottom two teams served up a cracker on Friday. There were eight goals - two of which were stunning volleys - and two red cards in a remarkable contest that leaves the Mariners eight points adrift at the foot of the table. The game was goalless after half an hour, but a sensational end to the first half saw the two sides tee up an astonishing back-and-forth that led to the first 5-3 in A-League history. Eric Bautheac executed a brilliant overhead-kick to break the deadlock and then Alex Lopez doubled Brisbane's lead with a glorious strike from just inside the penalty area five minutes later. Central Coast's response was swift, with Connor Pain nodding in, but Tobias Mikkelsen looped in a spectacular header on the stroke of half-time. There was still time for Aiden O'Neill to lash in before the break and the action continued at a frantic pace following the restart. Lopez drilled home in superb fashion, before O'Neill saw red when he was given a second booking for dissent. Dylan Wenzel-Halls made it five for the visitors with 16 minutes remaining, with Jordan Murray's response late on merely proving a consolation as the Mariners ended with nine men due to Matt Simon's last-gasp dismissal.